Our standard Chaud Devant Apron is characterised by a simple and minimalist design and as a result is very agreeable to wear. The interwoven satin stripe in the fabric creates a smart, sophisticated look. This half-length model can be fastened at the top. 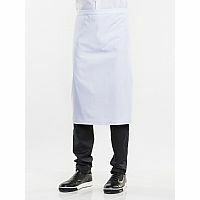 Thanks to its solid color, the Chaud Devant Santino White Apron goes together perfectly with any blouse or chef jacket.